RAGETRADES! 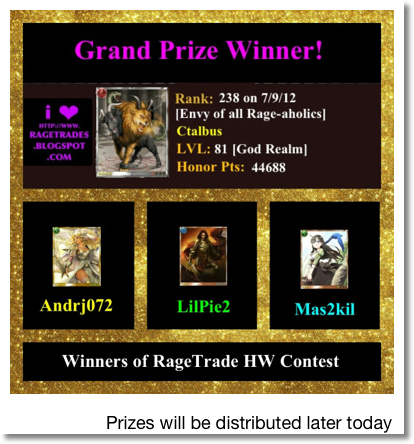 YOUR SOURCE FOR RAGE of BAHAMUT INFO, HELP and TRADES: *Updated* ROB Holy Wars Contest. *Updated* ROB Holy Wars Contest. Special Thanks to AdamBalm for taking the time to take screenshots of each days results, even though he was not one of the top rankers. You've been a huge help and I'm sending something your way. Ty all for participating! I appreciate all your kind words and encouragement. I wish you all the best of luck in and outside the game. 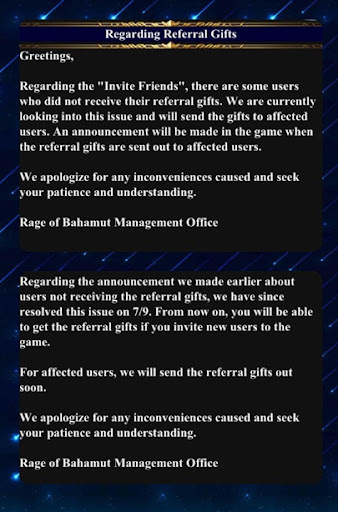 Unfortunately the individual I buy my Rupies and invite cards from has been unable to receive the referral bonuses due to the issue ROB is having. I personally tested this by referring someone to see if ROB had actually fixed it (like they claim above). That was 2 hours ago, and I have yet to receive anything. In any event the prizes displayed in orange will be distributed when the issue IS ACTUALLY RESOLVED. The other prizes will still be delivered to the winners later today. I apologize for any inconvenience this may cause. Ok problem solved with my supplier. She says she will have what I need for you guys within the next few days. Thank you for your patience. The new invite rules kinda slow the process down now..
Next contest I'll just but them ahead of time. And let them sit in my trades. Bc all those Luci's take up way too much space in my deck lol. Thank u. And i will leave your logo on for awhile. Thank you, you really did not have to, I will be leaving your logo on for a long time as well. Good luck on the next event and hope you rank super high! CTALBUS: you were scheduled to get ur LUCI's today + 750Rupies, I haven't forgotten about u, but just got them right before maintenance. So I will send them as soon as server is back up or first thing when I get up in morning thanks.